OK I am officially in love with this Elegant Soiree Designer Series Paper. 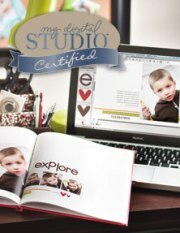 I knew I was going to like it from looking at the new catalog but having it in my hands and using it–WOW! 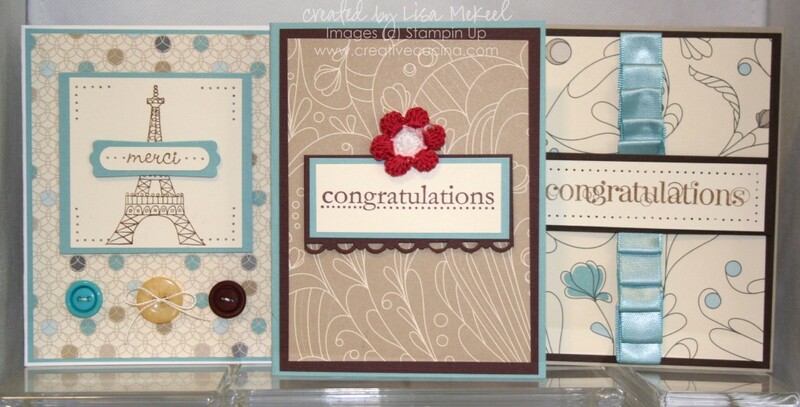 The colors are great: Crumb Cake, Baja Breeze, Very Vanilla, Soft Suede, and Basic Gray. 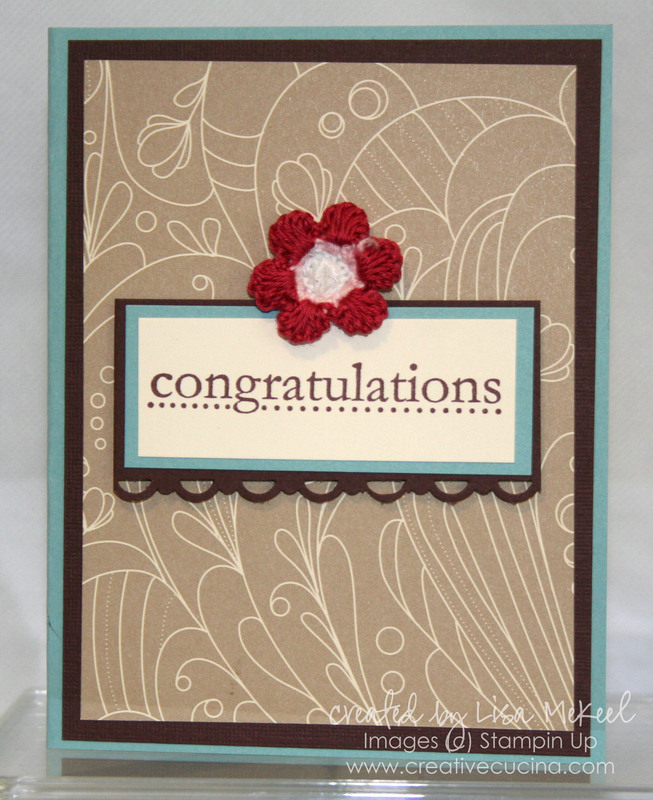 Card number 1 is a simple congratulations card, and uses a few retired items. I have to use up the old to make room for the new, right? 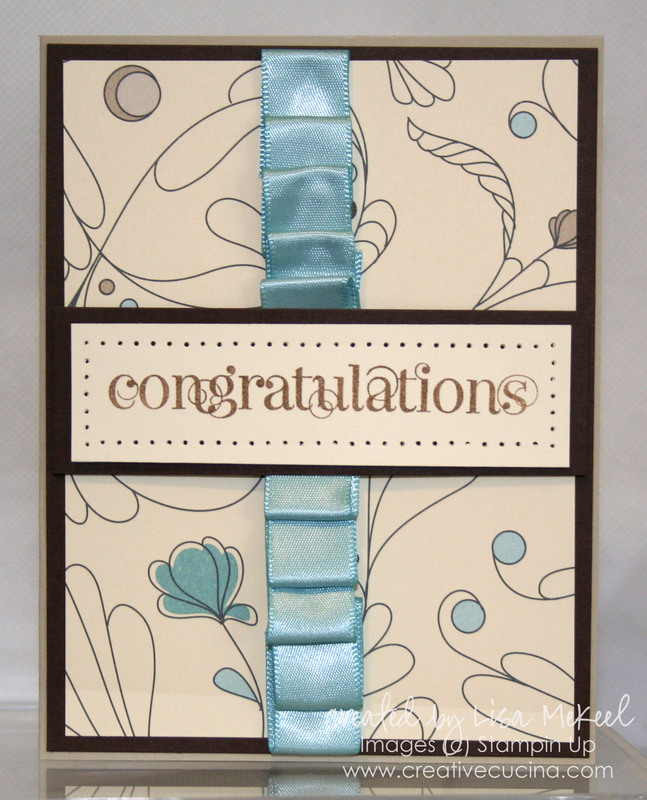 For the base, I used Baja Breeze, layered with Chocolate Chip and Elegant Soiree Designer Series Paper. The sentiment is from Congrats (retird SAB set) stamped with Chocolate chip ink on Very Vanilla. I layered the Vanilla on Baja Breeze and Chocolate Chip, scalloped with the Scallop Trim Border Punch. 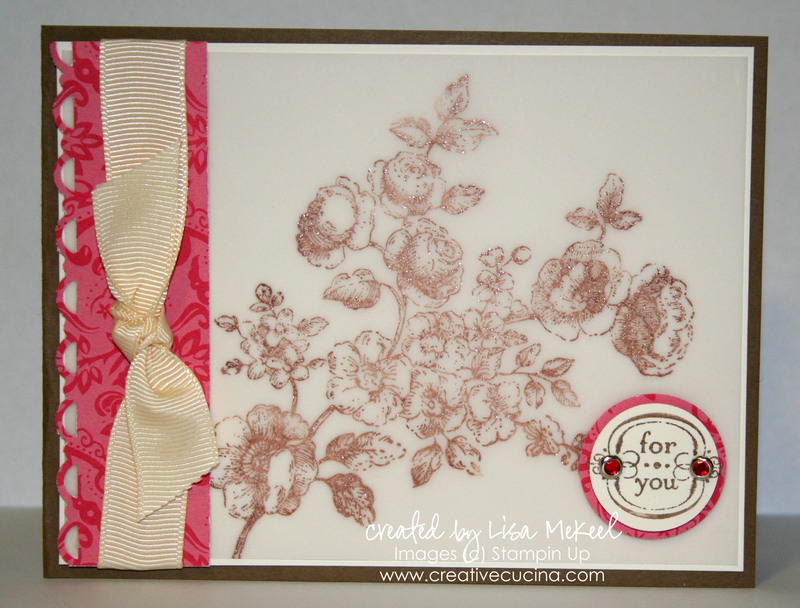 I attached the sentiment layer to the base with stampin dimensionals and added a Crochet Flower (Fleurette) with a stampin dimensional as well. The Fleurette is actually on backwards, but I didn’t want the pink to show so I used the reverse side. I think the pop of red works on the card because everything is so neutral. It’s hard to pick a favorite, but I think this might be it. 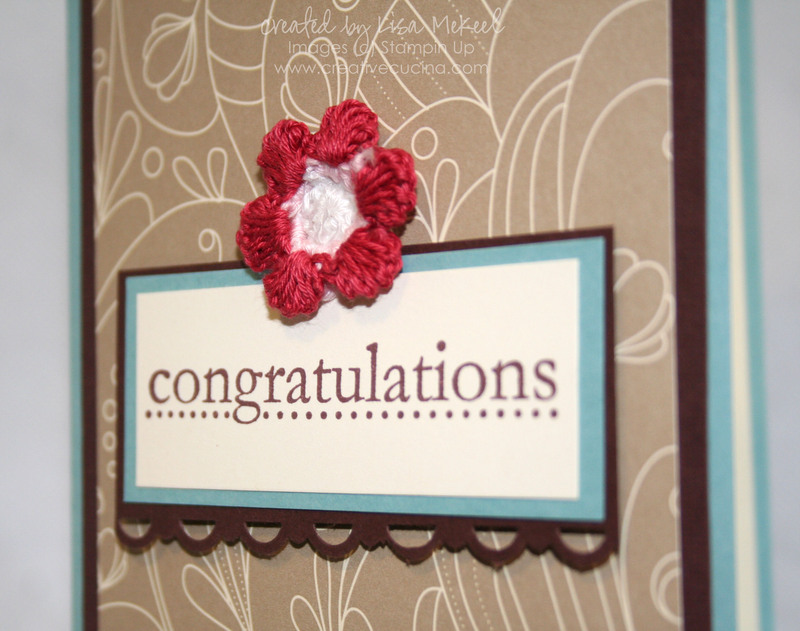 Even though I used up the last of my Valet Ribbon Originals Baja Breeze Satin Ribbon (it was so worth it). 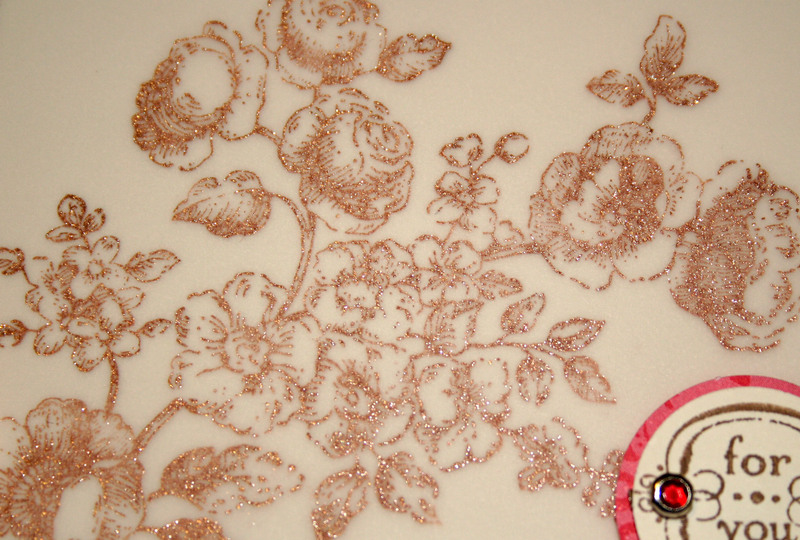 The base is Sahara Sand, layered with Early Espresso and this awesome Elegant Soiree DSP pattern. I folded the ribbon and used mini glue dots to secure each fold. 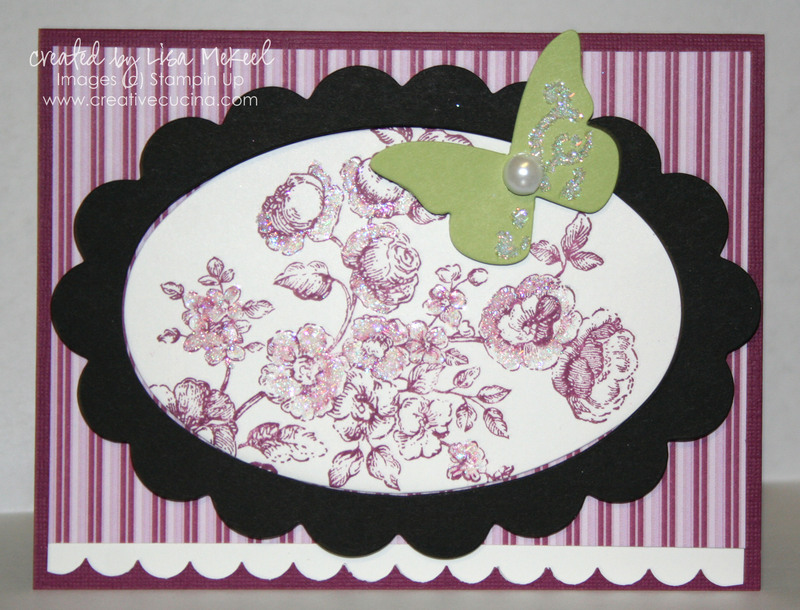 Then, I adhered the ribbon to the card with some more glue dots. Across the front, I stamped “congratulations” from Curly Cute in Soft Suede ink on Very Vanilla card stock. I paper pierced around the sentiment and framed it with a layer of Early Espresso. 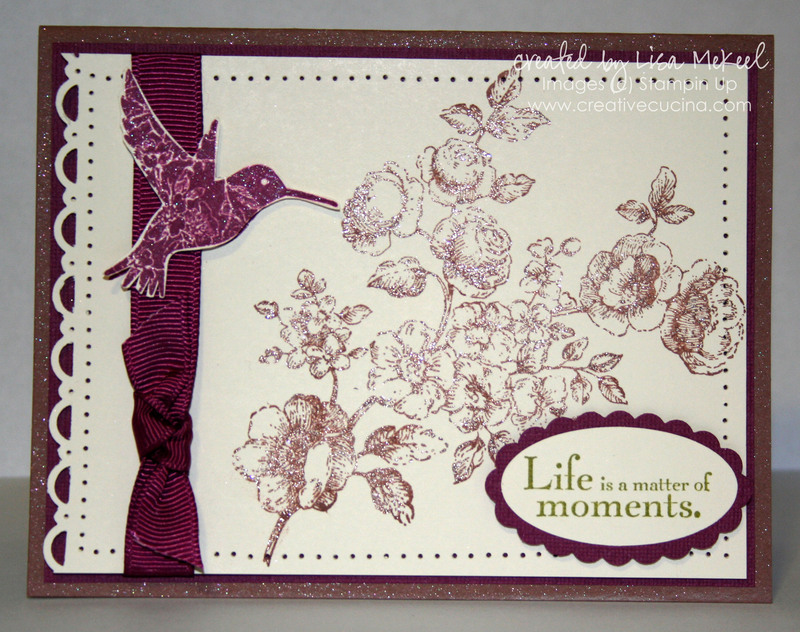 I added two stampin dimensionals to the ends and attached it over the ribbon, adhering it to the base. 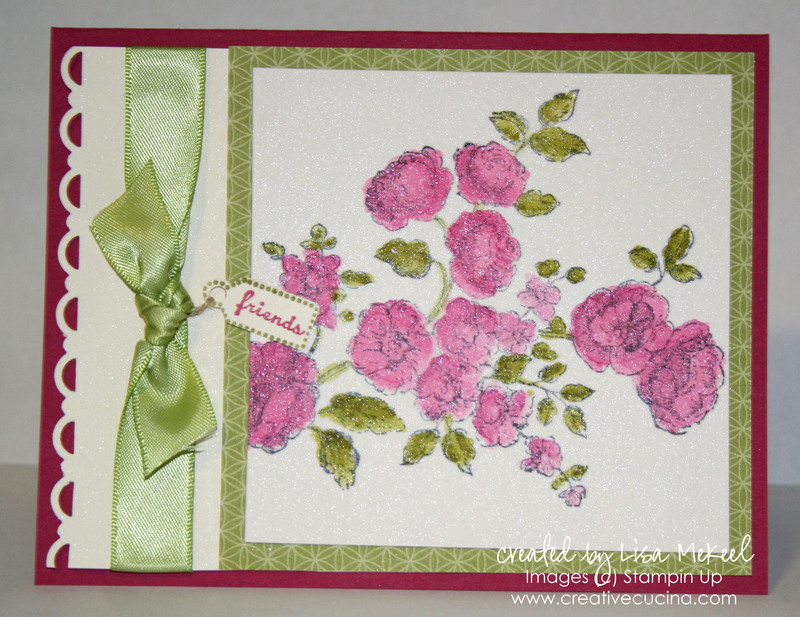 Finally, card number 3 turned out even cuter than I imagined. The base is Gina K Luxury White base weight, layered with Baja Breeze and yet another pattern from Elegant Soiree DSP. 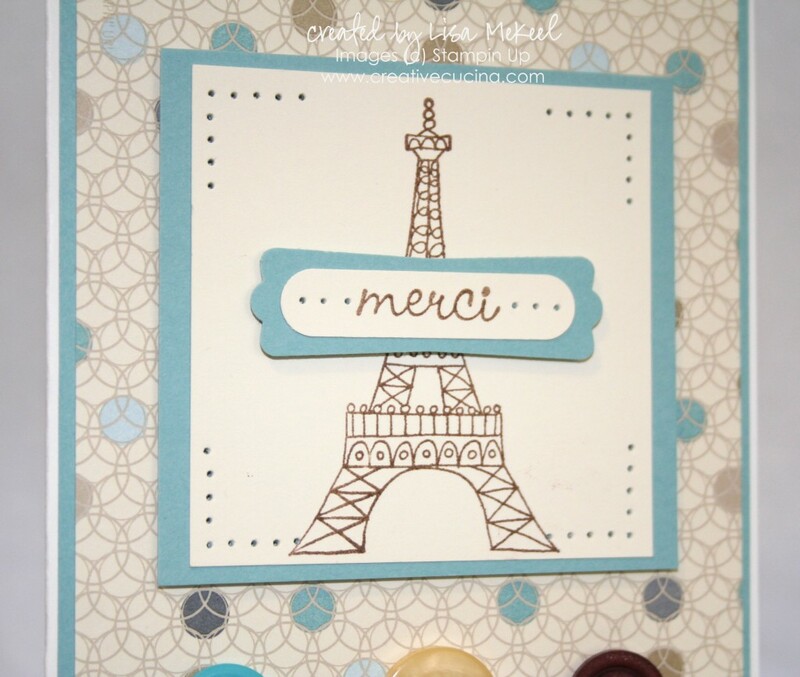 In keeping with the french theme, I stamped the Eiffel Tower image and “merci” from Chic Boutique with Soft Suede ink on Very Vanilla card stock. I paper pierced just the corners of the main image and matted it on Baja Breeze. 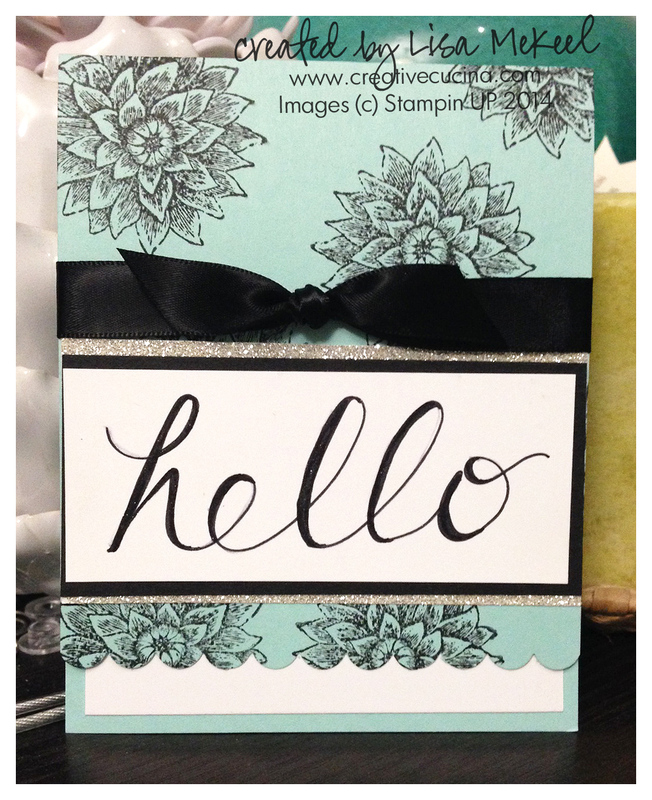 The sentiment is punched out with the Word Window Punch and layered on Baja Breeze Modern Label Punch. I paper pierced on either side of the sentiment as well. 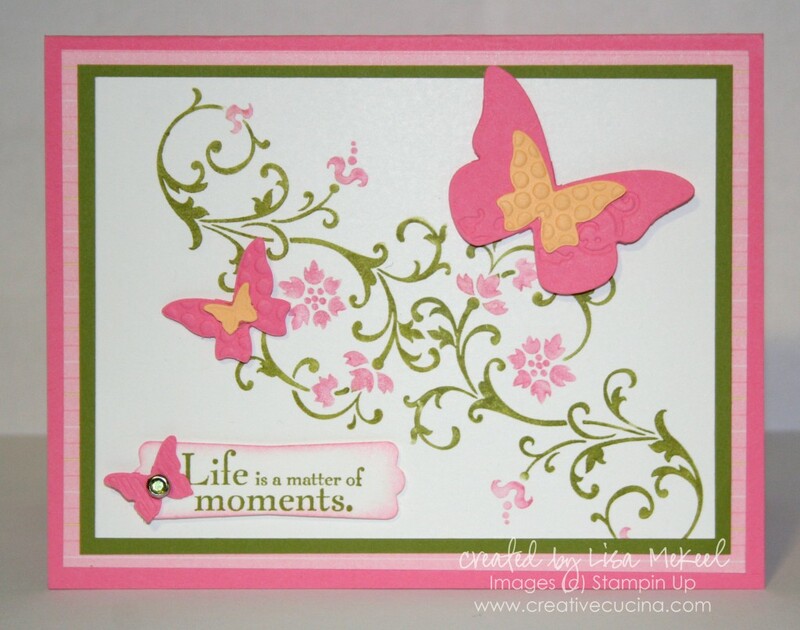 That was attached to the base with stampin dimensionals. And since I turned into a button freak, I had to add three buttons to the bottom. Even though the colors are not exact, I think they work. 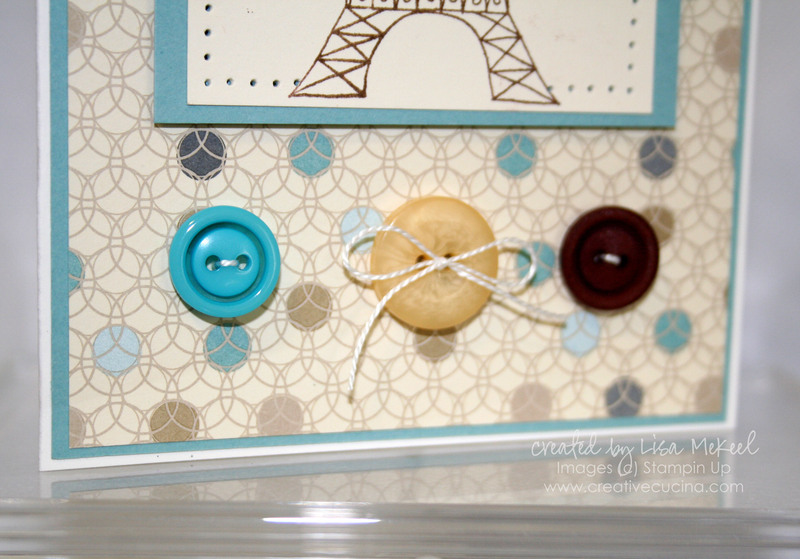 Buttons are from Button Latte and Brights Collection. I tied some white string through them, and knotted the one in the center to make a bow. I think it makes the card!